First published in Sweden, 2002. Sail of Stone is a book of two parts: a rather mystical, music-name-checking-heavy first half in which nothing much happens; and a more down-to-earth, faster-moving second half. Following the tradition set in earlier books, there are two main plots in Sail of Stone. In both of them, it is not clear whether a crime has been committed, consequently much time is taken up with obfuscation, hesitation and ponderings as to whether there is even an investigation to be undertaken. Both storylines involve Gothenburg’s team of police detectives. In one, Aneta Djanali follows up a neighbours’ report of possible spousal abuse in the downmarket area of Kortedala. The woman concerned, Anette Lindsten, will not open the door, and when Aneta returns later to allay her feelings of unease, she encounters a bizarre scene. It becomes Aneta’s mission to find Anette and discover what is happening to her and who is responsible, questions that are frustratingly intangible but which lead in unpredictable directions. During her investigation, Aneta reflects on her African heritage – her parents were immigrants from the Upper Volta, a country that since changed its name to Burkina Faso – and also continues her relationship with her colleague, the widower Fredrik Halders, a touching sub-plot. The other storyline concerns Erik Winter, who is more concerned with buying a piece of land by the sea and building a house for his partner Angela and their daughter Elsa, than in his work. (This is a change of character caused by dramatic incidents in a previous novel, Frozen Tracks.) However, when an old girlfriend who lives on an island on the archipelago contacts him because her father has gone missing in Scotland, Erik eventually decides to act. After much introspection, he contacts his old friend Steve Macdonald from the Met; the two men, together with their partners, travel to Scotland to unravel the mystery. Åke Edwardson’s novels are idiosyncratic. The separate stories are told in paragraphs within a chapter, together with what seem to be random paragraphs about un-named people (at least one of whom seems mad). In addition, several characters in Sail of Stone have the same, or a very similar, name. This can be a disorienting experience for the reader, and together with elements such as all the music references and the various reflections on sea, stone and sail, make the first half of the book seem a little self-indulgent. One advantage of this style, however, is that the atmosphere of Gothenburg is extremely well-depicted, and is a most enjoyable component of the novel. The second half of the book is in many ways much more satisfactory, in that things actually happen and reader becomes genuinely involved in how both stories will pan out. However, it skates over many obvious questions, particularly in Aneta’s investigation, in which she does no checking of the characters she encounters, nor does she interview any of the neighbours who have allegedly observed and reported the problems. The ending of the book is disappointing in that the resolutions take only a couple of pages, which feels too truncated after such a long preamble and build-up. Despite its discursive, leisurely nature, Sail of Stone is a very enjoyable book for all the reasons I’ve given; because of the excellent translation; and because of its evocative descriptions of the sea and of the fishermen’s trade. I thank Barbara Fister for so kindly sending me this book. Her review of it is at Reviewing the Evidence. 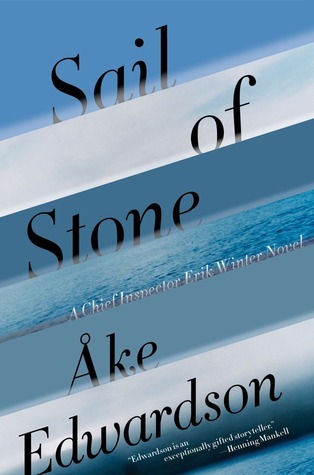 Other reviews of Sail of Stone are at: International Noir Fiction and Nordic Bookblog. This book is STILL on my TBR pile which is a shame as have enjoyed Edwardson’s previous books. Despite its apparent flaws which you’ve mentioned in your review I think I’m likely to enjoy reading it. It just takes me a while to get around to things. I am finally reading ‘Bone and Cane’ at the moment and enjoying it. It’s a little bit different which I like. Thanks for another excellent review. I’ll have to weigh and measure these book recommendations as I stagger under the oncoming avalanche of the TBR stack. Maxine – Thanks for the excellent review as ever. Interesting how the two halves of this novel are so different; I’m glad the second half pulled things together a bit for you. And please don’t get me started on Translated Out Of Order (TOOO) Syndrome. So frustrating! I’m not surprised you’ve not yet read those first two. Excellent review – and a good description of what made this book puzzling, pleasing, and at times not at all satisfying! I really enjoyed the first handful, but the pace is slower and slower, and as far as I remember, I gave up reviewing Room No 10 – if I finished it at all? He is a good writer, but I think Håkan Nesser is much better at keeping the reader interested in the characters so even when his plots are slow, I just love following their development. Thanks, everyone. I’ve been away for a few days, hence lack of responses.Possibly this one is for Scadinavian crime fiction completists, but there are strengths to it. Sarah, glad you are enjoying Bone & Cane. Bernadette, this one follows straight on from Frozen Tracks (there was a long gap while the first two were published in the interim) so would be a good one to read next, if you are going to continue with him.